Acting on information received, the Wabbit and Lovely Lapinette slipped into the airport unobserved and, hiding behind a distant carousel, they watched in horror as Genetically Modified carrots poured from the luggage belt. "This carousel is never used," whispered Lapinette. "That’s because it never works," said the Wabbit. "Well it’s working today," said Lapinette. "Do you think the Skarrots will go through customs?" 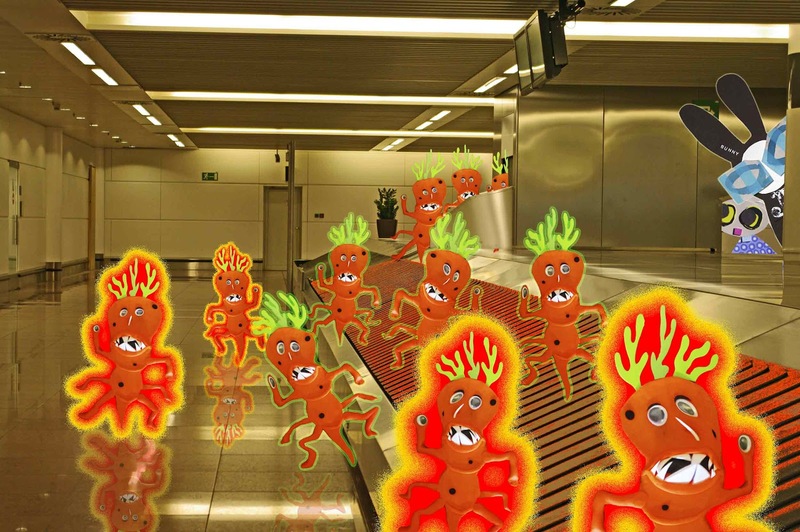 "I don’t think they’re big on passports," said the Wabbit. "Maybe they’ll eat their way through," said Lapinette. The Wabbit started to smile, but then he grimaced. "The things will spread out across the city, foraging," he said. "I suppose they’re not big on restaurants either," said Lapinette. "They’ll start with the customers," said the Wabbit, "and then eat furnishings, crockery and they particularly like to destroy High School Musical posters." "That’s in their favour, I suppose," said Lapinette sniffily. The Wabbit allowed himself a chortle, but one of the Skarrots turned and they both ducked for cover. "What can stop them?" hissed Lapinette. "I don’t know yet," said the Wabbit. "Exploding them with C4 only causes them to divide and multiply." "Every enemy has a weak point," murmured Lapinette, thinking of a book she’d been reading." "Did you find that in the Carrot Library?" asked the Wabbit. "No, in the "Day of the Triffids"," said Lapinette. “How do they do it?” asked the Wabbit. "Crop ‘em, chop ‘em and cook ‘em," said Lapinette sweetly.